Should I keep using a manual toothbrush or switch to an electrical? | Cherry Blossom Dentistry Toronto Which brush is best for you depends on your present oral hygiene, your gum health and manual dexterity. In general, if you use your manual toothbrush properly to remove plaque without traumatizing the gum line and inducing it to recede, you may safely continue to use your present manual toothbrush. Just make sure you are replacing it every 3-4 months. Should I keep using a manual toothbrush or switch to an electric? “Should I keep using a manual toothbrush or switch to an electric?” I hear this question almost every day from my clients. And my answer is “it depends”. 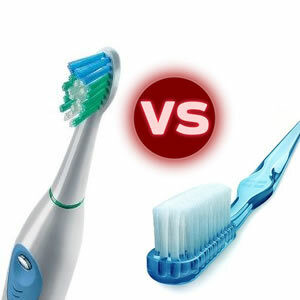 Which brush is best for you depends on your present oral hygiene, your gum health and manual dexterity. In general, if you use your manual toothbrush properly to remove plaque without traumatizing the gum line and inducing it to recede, you may safely continue to use your present manual toothbrush. Just make sure you are replacing it every 3-4 months. Electric brushes may come with different power-settings, such as “clean”, “sensitive”, “massage”. This provides the option to customize the speed for your comfort. An electric toothbrush is the only good option for people who suffer from arthritis, carpal tunnel syndrome or any other painful or movement-restricting condition affecting manual dexterity. Some studies show that electric toothbrushes cause less gum recession compared to manual brushes and therefore are a good choice for patients with good oral hygiene but who have a tendency to over-brush , known as “hard-brushers”. One important factor to consider when purchasing an electric brush is that they are not all created equal. There are brushes on the market that will do a worse job than a manual. Speak to your dental health care professional before deciding whether to switch to electric and which one is best for you.